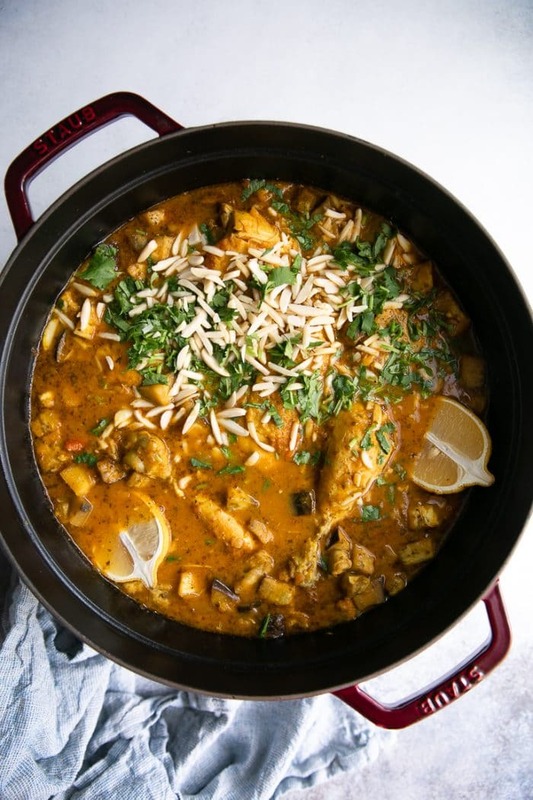 Filled with tender mouthwatering chicken pieces, this Easy Moroccan Chicken is simmered with delicious aromatic spices, tomatoes, eggplant, dried fruit, and topped with crunchy slivered almonds. 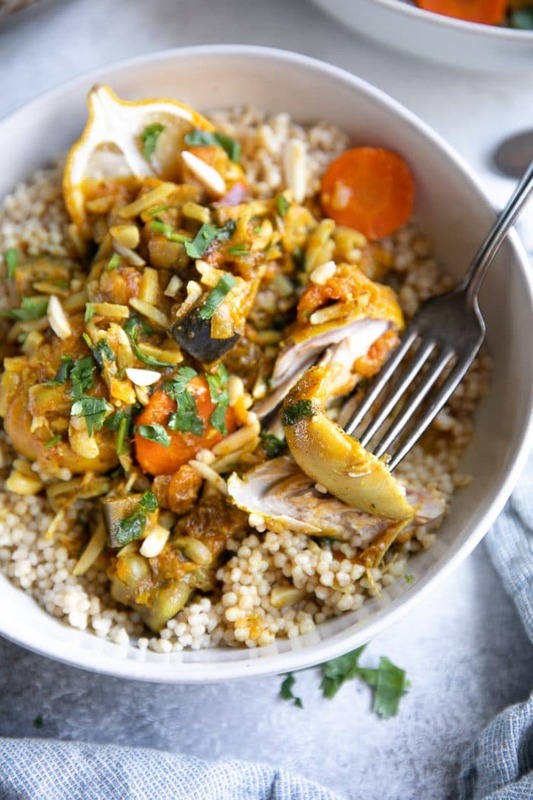 Enjoy this melt-in-your-mouth Moroccan Chicken Recipe with a side of rice or couscous for a meal the whole family will love! 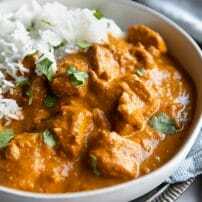 Unlike classic and well-known recipes like Chicken Tikka Masala or Chicken Piccata, Moroccan Chicken can be interpreted in many different ways. Now, I haven’t made it to Morocco (yet), so some may argue otherwise. However, until I learn of this, I have decided that there is no set rule for preparing Moroccan Chicken. That said, Moroccan cuisine often contains several key ingredients that make it, well, Moroccan. 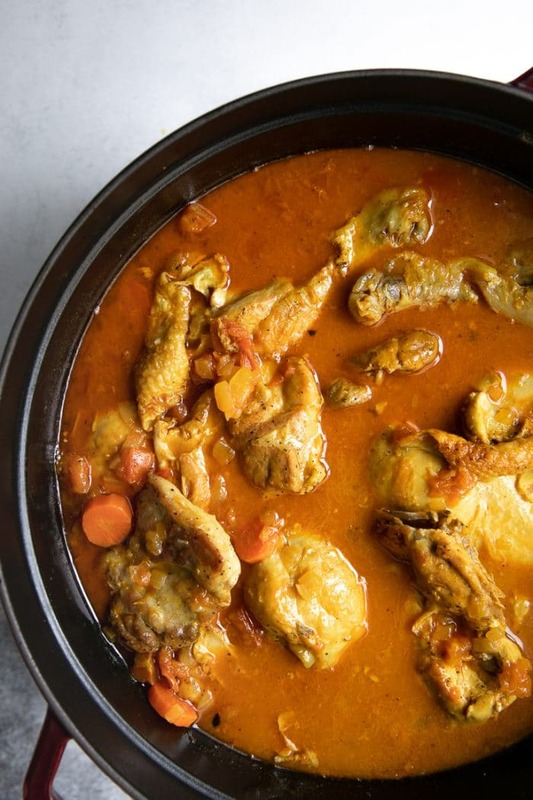 Several ingredients are found in this aromatic Moroccan Chicken Stew (paprika, cinnamon, dried fruit) and several are not (Saffron, anise, olives). 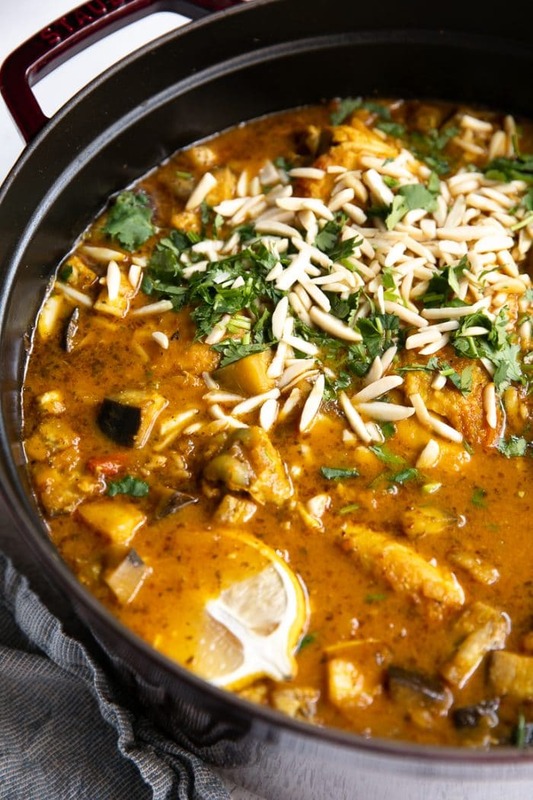 Either way, this delicious dish is the perfect introduction to cooking with more spices and unique ingredients- don’t worry, nothing so unusual that it requires a trip to a special market. My whole family enjoyed this with couscous and a cucumber salad, but feel free to serve it with rice or small pasta. 1 | Chicken. I added a lot of chicken to this Moroccan Chicken Recipe. For a moment I thought I had purchased too much, but I’m happy I did because it is so juicy and so tender it literally falls from the bone and melts in your mouth. Technically, you can use any kind of chicken that you want, but I strongly recommend the bone-in and skin-on kind (breast, drumstick, thigh). With that said, I do not recommend chicken wings or any other part of the chicken that has teeny tiny bones. The meat will fall from the bone, and tiny bones are hard to fish from the pot. 2 | Onion, carrots, garlic. If I’m making a stew, it needs to have, at the very least, chopped onions and loads of minced garlic. Some may call it the base ot the mirepoix, but I call it flavor. If you don’t like a lot of garlic, feel free to cut the amount in half. 3 | Spices. There is no shortage of spices in Moroccan cooking. You don’t need them all to have a flavorful dish, but this recipe includes several of my favorites. Paprika. Made from dry, sweet red peppers, Paprika adds not just flavor, but color to this Moroccan Chicken. It’s important not to burn the ground paprika when mixing it with the onions and carrots, which may turn it bitter. Turmeric. Somewhat bitter (not in a bad way), turmeric is often recognized for its bright yellow color. Often used in Moroccan cooking in addition to artificial yellow coloring, here you’ll only find turmeric and nothing artificial. Coriander. The roasted and ground seeds from the cilantro plant, coriander is another popular spice commonly found in a number of dishes it comes with somewhat nutty, lemony flavor. Ground Cumin. From the dried fruit of a plant in the parsley family, ground cumin is one of the most popular and well-known spices. As it is quite flavorful, I typically add less to start and add more as I go (especially if I want to taste other spices in the dish). Ground ginger. Fragrant, somewhat spicy (not in the way a hot chili pepper is spicy), and practically required. If you’ve had your ground ginger lying around for a while it tends to darken a bit and turn bitter. Yours should be a cool, pale yellow. Cinnamon. 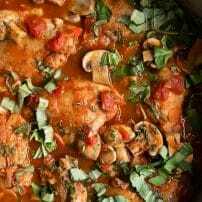 Fragrant and somewhat sweet, the addition of ground cinnamon is the perfect balance to the savory chicken and tomatoes and dried sweet fruit like apricot and raisins. 5 | Lemon juice & Zest. Full disclosure- preserved lemons would have been more authentic. But, I didn’t have any on hand and really wanted this recipe to be easy enough that anyone could feel they could make it. If you’re interested in learning about preserved lemons or want to make your own, check out this post about preserved lemons. 6 | Eggplant. My husband loves eggplant. 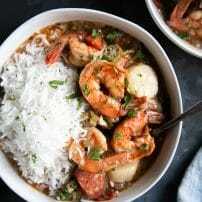 With so many delicious flavor elements going into this stew, I thought this would be a perfect time to add his favorite and make him happy. If eggplant isn’t your favorite thing in the whole world, don’t worry. It cooks and breaks down so much that you can hardly tell it’s there. That said, if you’re planning to pick it out…that’s a bad plan. You’re better off leaving it out. 8 | Almonds. Used as both a key ingredient and as a garnish, almonds add a creamy crunch. Heat a large heavy-bottomed skillet over medium-high heat (I used my cast iron skillet). Add 1 tablespoon of oil and swirl to coat the bottom of the pan. When the skillet is hot, add the chicken pieces, fitting as many into the skillet that will fit comfortably. Work in batches to brown the chicken, cooking each side for approximately 2-3 minutes only (the chicken will not be cooked through entirely). Remove chicken to a clean plate and repeat until all the chicken has been browned. Reserve approximately 1 tablespoon of the chicken fat and discard the rest. 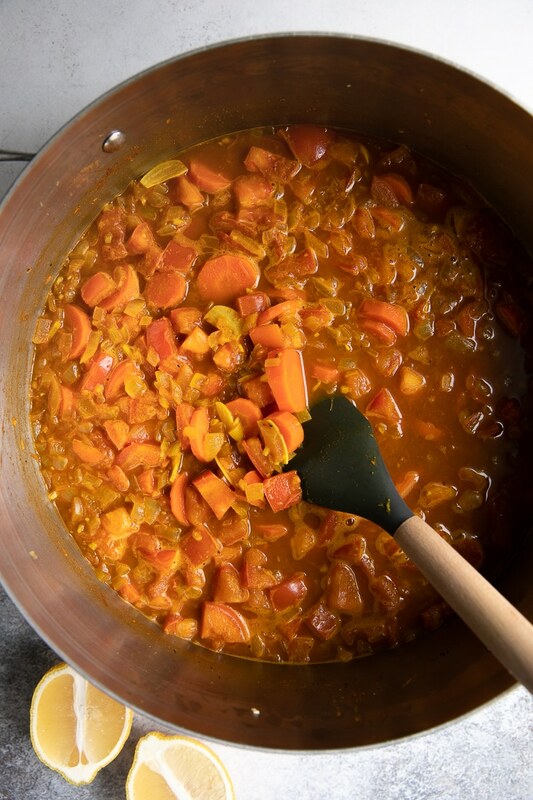 Heat a large heavy-bottomed pot or Dutch oven over medium-high heat (at least 10 quarts). Add the reserved chicken fat (or olive oil) and onions and mix well. Cook the onions for 2-3 minutes, stirring frequently. Add the carrots and continue to cook for an additional 3-4 minutes, remembering to stir occasionally to prevent burning. Reduce heat to medium-low and stir in the garlic. Cook for 30-60 seconds, mixing continuously. 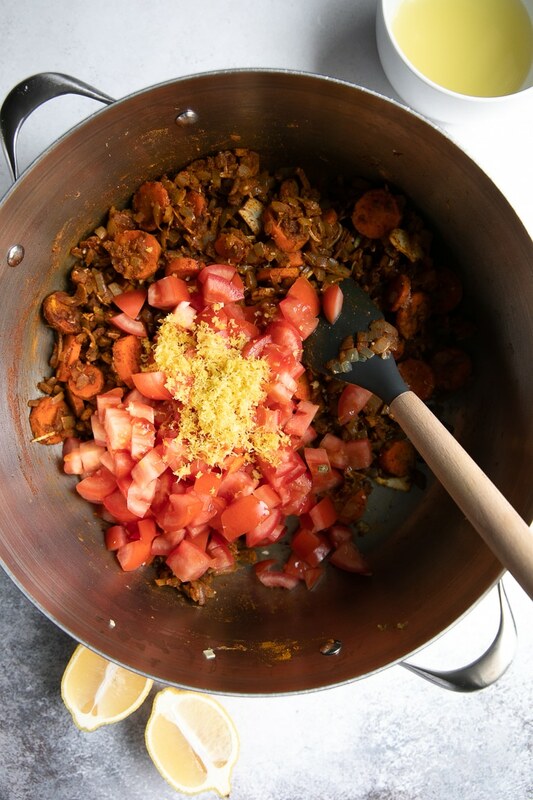 Add the paprika, salt, pepper, turmeric, coriander, fennel seeds, cumin, ground ginger, and ground cinnamon. Mix well to combine. Cook over medium-low heat for 30-60 seconds, stirring continuously. Add the tomatoes, lemon juice, and lemon zest. Stir well and combine with the onions and spices. Add the water (or chicken broth) and increase the heat to medium-high. Bring to a boil and immediately reduce heat to a low. Simmer for 5 minutes or so. Arrange the chicken pieces back into the pot (if the sauce is extra thick, add an additional cup or two of water). Return pot to a boil. Reduce heat to low, cover the pot and allow the chicken to simmer for 20-30 minutes. After 20-30 minutes, carefully rotate the chicken, cover and simmer for an additional 10 minutes. Gently stir in cubed eggplant, raisins, apricots, and marjoram into the chicken and continue to cook, covered, for 15 minutes. Remove cover and cook over medium-high heat for an additional 15 minutes or until eggplant is fully cooked. By this point, the chicken should be falling off the bone and the eggplant should be soft and cooked. Continue to cook for longer, if needed. Season with additional salt and pepper, or other spices, to taste. Sprinkle with slivered almonds, sesame seeds, and fresh cilantro. 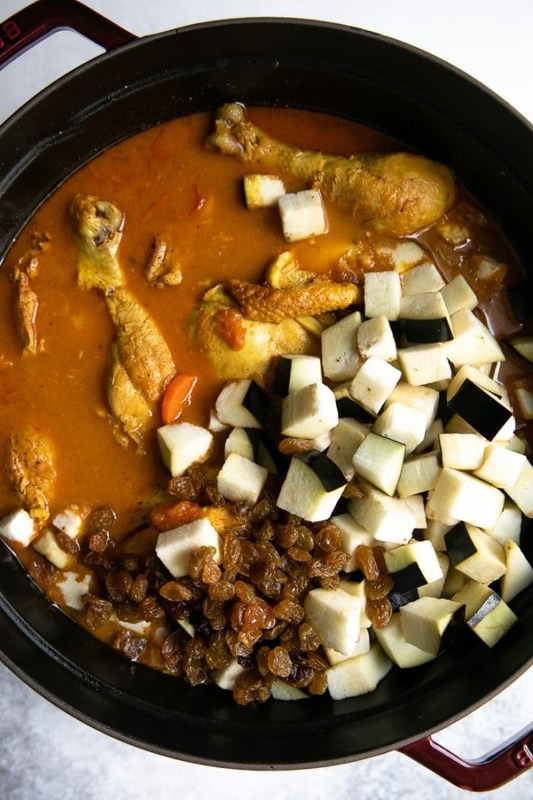 Aside from carbohydrates, this Moroccan Chicken Recipe has everything – vegetables, meat, (dried) fruit. That said, if you’re going to mix it up with something (probably carbs), I highly recommend picking something neutral. My first choice is always couscous. 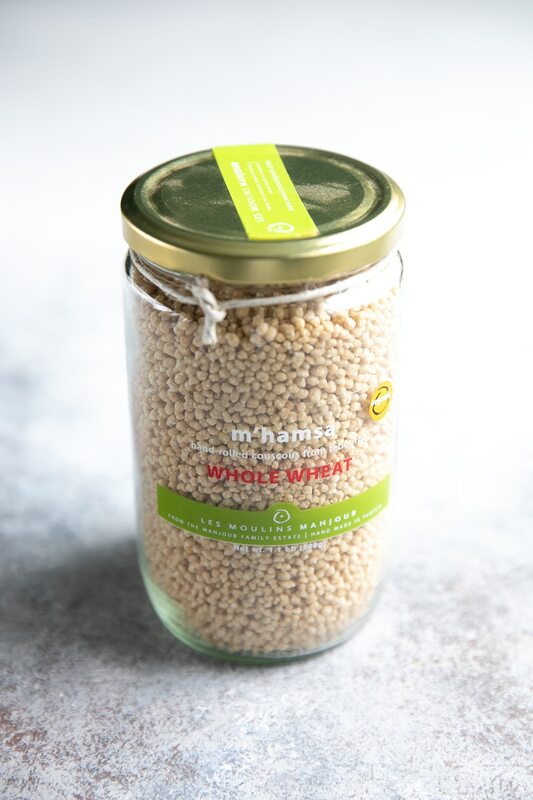 I really love this brand of couscous, but use what you love most. Other alternatives include rice, quinoa, or even cauliflower rice if you’re sticking to a lower carb diet. Pita bread and naan, or even small pasta would taste great. If you want to add something on the side, dips like this White Bean Hummus with Za’atar and Sweet Paprika or Mutabbal (Baba Ganoush) are excellent options (in addition to hummus, of course). 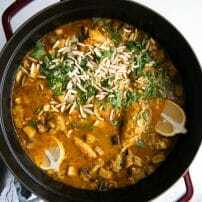 If you try making this Moroccan Chicken, please leave me a comment and let me know! I always love to hear your thoughts. DON’T FORGET TO PIN AND SHARE THIS MOROCCAN CHICKEN RECIPE AND ADD IT TO YOUR NEXT WEEKLY MEAL PLAN! 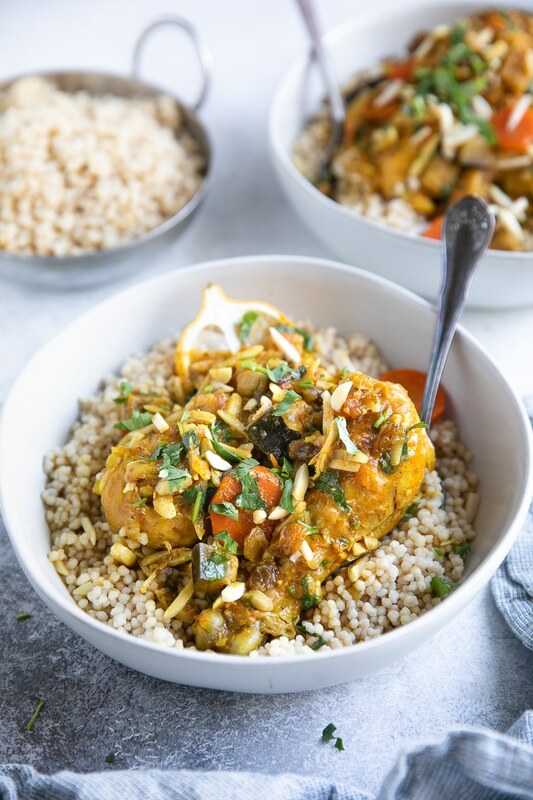 Filled with tender mouthwatering chicken pieces, this Easy Moroccan Chicken is simmered with delicious aromatic spices, tomatoes, eggplant, dried fruit, and topped with crunchy slivered almonds. Brown the chicken. Heat a large heavy-bottomed skillet over medium-high heat. Add 1 tablespoon of oil and swirl to coat the bottom of the pan. When the skillet is hot, add the chicken pieces, fitting as many into the skillet that will fit comfortably. Work in batches to brown the chicken, cooking each side for approximately 2-3 minutes only (the chicken will not be cooked through entirely). 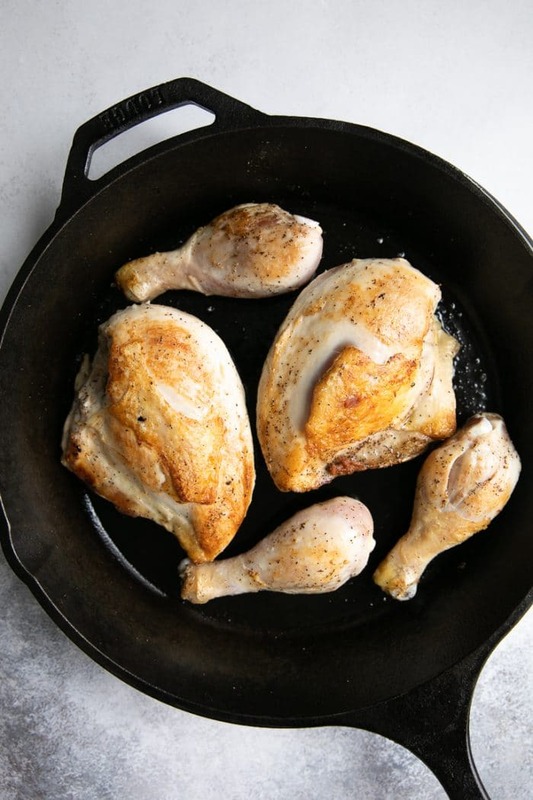 Remove chicken to a clean plate and repeat until all the chicken has been browned. Heat a large heavy-bottomed pot or Dutch oven over medium-high heat (at least 10 quarts). Add the olive oil and onions and mix well. Sauté the onions for 2-3 minute, stirring frequently. 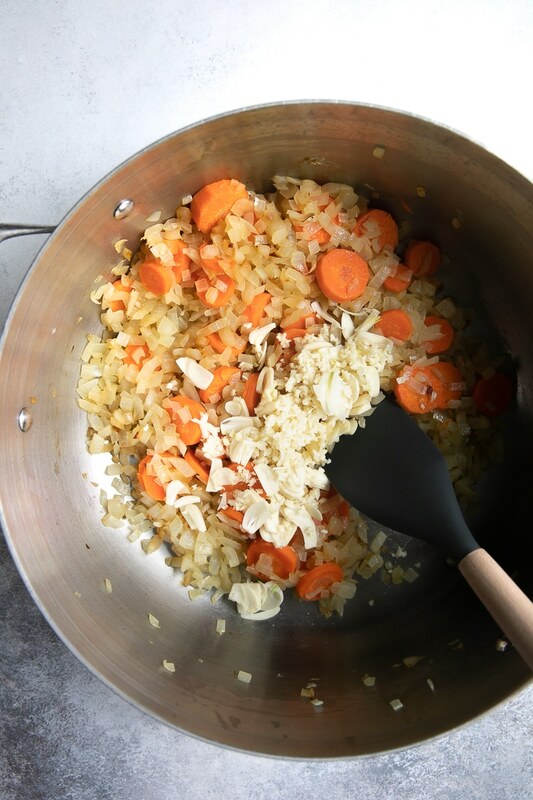 Add the carrots and continue to cook for an additional 3-4 minutes, or until onions are soft and translucent. Reduce heat to medium-low and stir in the garlic. Cook for 30-60 seconds, mixing continuously. 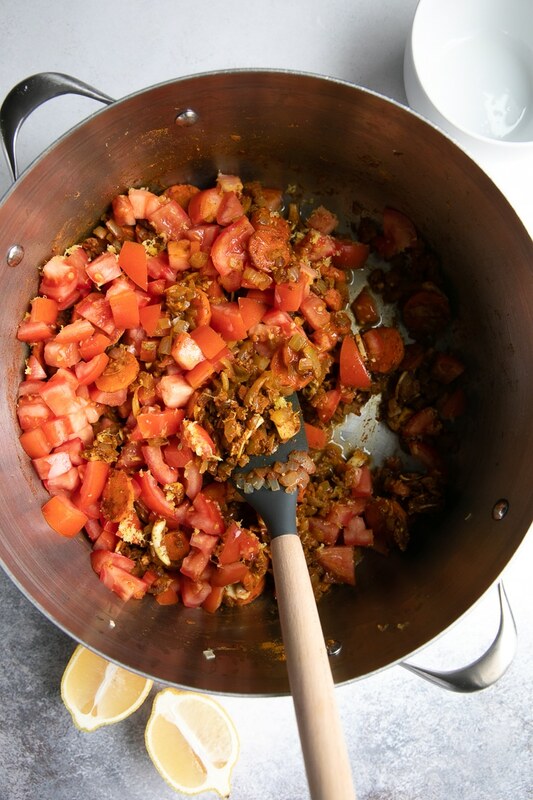 Add the chopped Roma tomatoes, lemon juice, and lemon zest and mix well to combine with the onion and spices. Add the water and increase the heat to medium-high. Bring to a boil and immediately reduce heat to a low. Simmer for 5 minutes. Arrange chicken pieces back into the pot (if the sauce is extra thick, add an additional cup or two of water). Return pot to a boil. Reduce heat to low, cover the pot and allow the chicken to simmer for 20-30 minutes. After 20-30 minutes, turn the chicken over, cover and simmer for an additional 10 minutes. Season stew with additional lemon juice, salt, paprika, or other spices as you see necessary. Sprinkle with slivered almonds and fresh cilantro for serving. Post originally published March 6, 2016 and updated on March 10, 2019 with updated images and post text.